Pyrolysis is rapidly developing biomass thermal conversion technology and has been garnering much attention worldwide due to its high efficiency and good eco-friendly performance characteristics. Pyrolysis technology provides an opportunity for the conversion of municipal solid wastes, agricultural residues, scrap tires, non-recyclable plastics etc into clean energy. It offers an attractive way of converting urban wastes into products which can be effectively used for the production of heat, electricity and chemicals. 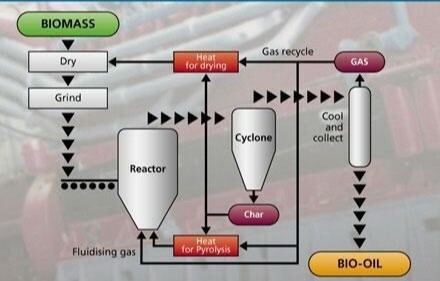 Pyrolysis process consists of both simultaneous and successive reactions when carbon-rich organic material is heated in a non-reactive atmosphere. Simply speaking, pyrolysis is the thermal degradation of organic materials in the absence of oxygen. Thermal decomposition of organic components in the waste stream starts at 350°C–550°C and goes up to 700°C–800°C in the absence of air/oxygen. Pyrolysis of municipal wastes begins with mechanical preparation and separation of glass, metals and inert materials prior to processing the remaining waste in a pyrolysis reactor. The commonly used pyrolysis reactors are rotary kilns, rotary hearth furnaces, and fluidized bed furnaces. The process requires an external heat source to maintain the high temperature required. Pyrolysis can be performed at relatively small-scale which may help in reducing transport and handling costs. In pyrolysis of MSW, heat transfer is a critical area as the process is endothermic and sufficient heat transfer surface has to be provided to meet process heat requirements. The main products obtained from pyrolysis of municipal wastes are a high calorific value gas (synthesis gas or syngas), a biofuel (bio oil or pyrolysis oil) and a solid residue (char). Depending on the final temperature, MSW pyrolysis will yield mainly solid residues at low temperatures, less than 4500C, when the heating rate is quite slow, and mainly gases at high temperatures, greater than 8000C, with rapid heating rates. At an intermediate temperature and under relatively high heating rates, the main product is a liquid fuel popularly known as bio oil. Bio oil is a dark brown liquid and can be upgraded to either engine fuel or through gasification processes to a syngas and then biodiesel. Pyrolysis oil may also be used as liquid fuel for diesel engines and gas turbines to generate electricity Bio oil is particularly attractive for co-firing because it can be relatively easy to handle and burn than solid fuel and is cheaper to transport and store. In addition, bio oil is also a vital source for a wide range of organic compounds and specialty chemicals. Syngas is a mixture of energy-rich gases (combustible constituents include carbon monoxide, hydrogen, methane and a broad range of other VOCs). The net calorific value (NCV) of syngas is between 10 and 20MJ/Nm3. Syngas is cleaned to remove particulates, hydrocarbons, and soluble matter, and then combusted to generate electricity. Diesel engines, gas turbines, steam turbines and boilers can be used directly to generate electricity and heat in CHP systems using syngas and pyrolysis oil. Syngas may also be used as a basic chemical in petrochemical and refining industries. The solid residue from MSW pyrolysis, called char, is a combination of non-combustible materials and carbon. Char is almost pure carbon and can be used in the manufacture of activated carbon filtration media (for water treatment applications) or as an agricultural soil amendment. Tagged Bio-oil, char, electricity, heat, MSW, Municipal Wastes, Organic, pyrolysis, Pyrolysis of Municipal Wastes, syngas, Urban Wastes. Bookmark the permalink. The description about this form of incineration – Pyrolysis – is noted and there is nothing new. As with most advanced thermal treatment systems (such as this incineration-style option called pyrolysis) the article does not add any details as to the ultimate issues that affect the Ultimate Client – the Public at Large and the Bank-Roller of these “so-called” advanced thermal treatment systems. 1] the costs to treat the waste. 2] the problems over emissions and toxiicity of the residual products discharged into air and ground. Bearing in mind that there are no such things as “zero emissions” in dry incineration processes (as pyrolysis is so regraded) that there will be toxic discharges as those Proscribed under the Stockholm Conventions for POPs and under the UNFCCC edicts for another tranche . For costs to treat as we now know that within 4 years at the most there will be No Gate Fees to Treat Waste and that by the end of this decade Costs for buying Waste from municipal Sources are likely to be greater than $75-00/€65/£50-00 per tonne and that these will rise progressively thereafter to around $150/€130/£100 per tonne because the revenue streams derived from treating waste are already exorbitantly high [a waste to energies plant that treats 400,000 tonnes per year of post-reclaimed organic material which incurs a capital cost of less than $175/€150/£110 Million will deliver a Return on Investment of less than 4 years – in North Western Europe (and these are not incineration plants like the pyrolisis programme here we might add) there is no justification in business to build such a plant. Even Anaerobic Digestion plants using a modified and super-advanced accelerated digestion system which can effect total digestion with 48 hours, can develop a near equivalent ROI of just over 5 years. The Public needs to know that that which is being portrayed here – incineration as pyrolysis is just not affordable and never was. For the issues of toxic wastes then without a doubt the anaerobic digestion and similar processes that work within a freely wet arena are without a doubt streets ahead of these dry incineration style pyrolysis plants as there are no gaseous emissions and there are no toxic releases to the atmosphere – ever. With regards to the heinous claim that the residual char is free of toxins, that sounds to be far from real. Of course it will contain toxic products and these will be available and be able to be leached from any “burial place” no matter how they are intrerred. Thus the residues as claimed will need certifications and interring in specialised land fill style enclosed depositories for at least 200 years or until someone can clarify that the ionertness has been achieved.